The World Wildlife Fund (WWF) has set what it believes to be the achievable target of doubling the number of tigers in the wild by 2022 (the next Year of the Tiger) . 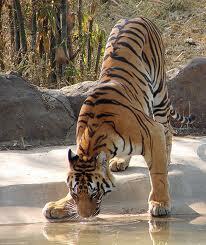 The main emphasis is on protecting tiger habitats. During the 2010 Year of the Tiger, all thirteen countries where tigers still survive in the wild, also committed to doubling their numbers. In March, 2010, the World Federation of Chinese Medicine Societies issued a statement urging its members not to use tiger bone or any other parts from endangered species . In June 2007, under pressure from tiger farm owners, China announced a plan to lift its trade ban on parts from farmed tigers. This plan was opposed by India, Nepal, Bhutan, and Indonesia as well as by tiger conservation groups around the world and by Oriental medicine organisations world-wide. If China legalises trade in parts from farmed tigers, experts agree, the poaching of wild tigers will increase. Unofficial and illegal sale of tiger bone products from Chinese tiger farms is believed to be continuing, however.